Around 117,000 people were consulted in the course of the Islington Council Controlled Parking Zone (CPZ) Consultation and over 11,000 registered their views. 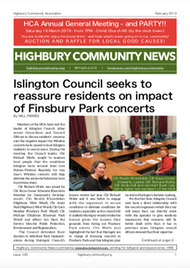 This response rate – close to ten percent of all those consulted - is the highest that Islington Council has ever received on any issue.� In most areas – Archway, Angel and the Stadium Control area where we live - opinions about the proposals were almost entirely negative. Only around the Whittington hospital – where staff and visitors impinge heavily on adjacent streets – and in the Finsbury area near Old Street, were residents keen for stronger parking controls. Richard Watts explained that the news leaked to the Islington Tribune and the Islington Gazette was correct, and that the Council would make no changes to parking arrangements in Archway, Angel and the Stadium Control area. 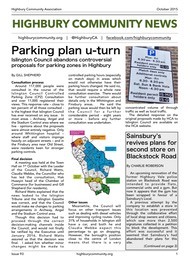 Though this decision had to proceed through the correct decision-making channels inside the Council, and would not finally be ratified by the Executive until January 2016, Richard Watts assured us that the decision was final.� I asked him whether minor changes might be made to controlled parking hours (especially on match days) in areas which would not otherwise have their parking hours changed. 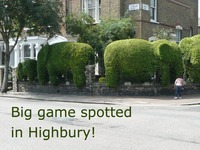 He said no, that would require a whole new consultation exercise.� There would be further consultation about details only in the Whittington and Finsbury areas.� He said the parking issue would then be left by the Council for a further considerable period - eight years or more - before any further consultation was undertaken. Meanwhile, the Council will focus on other transport issues such as dealing with diesel vehicles and improving cycling routes. Only 31% of households in Islington still have a car, and both he and Claudia Webbe expect this percentage to go on dropping. However, the borough’s position close to the centre of London means that there is a very concentrated volume of through traffic as well as local traffic.